Breakfast is always hard for me. I am never sure what I feel like... and I have read a few reports that say we should eat breakfast like a champion to get our body ready for the day. 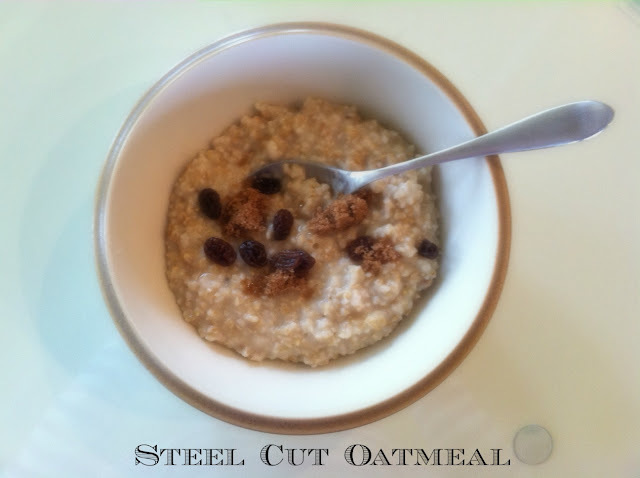 Steel cut oatmeal seems to be slightly better for you because it registers lower on the glycemic index, which means it takes our bodies longer to break down the starch. Steel cut also goes through a little less processing than the rolled oats, so it seems like it could be slightly healthier because of that as well. For more info, read this article. The difference between the two doesn't seem like much to me - steel cut is just cut into little seed-like pieces, and the traditional rolled oats are like thin little leaves. They taste about the same. One big difference is that steel cut takes a lot longer to cook (about 30 minutes). But my mom had the brilliant idea of cooking a large pot of it, and storing the leftovers in the fridge to use for a few days. It makes it fast and easy in the morning if you already have it pre-made. All of the little research I have done has said both types of oatmeal are much better for you then the instant oatmeal, which is much more processed and has loads of sugar added. I bought the organic steel cut oatmeal from Whole Foods and added some raisins (and a pinch of brown sugar, I know... not healthy). You can find it at most grocery stores. Either way you go, oatmeal is a great "whole grain" start to the day!! What's your favorite go-to breakfast meal? I have oatmeal every morning (it also increases milk supply for when baby comes=-)). I wish that steel cut didn't take so long to cook! I cook a batch of steel cut ahead like your mom suggested. I also like quinoa the same way (I can't eat it w/o the brown sugar, either) and it's very quick cooking. It's a whole grain, too, and another healthy and warm breakfast alternative. You can put anything on it just like oatmeal. We eat our oatmeal with a little coconut shavings, honey & peanut butter (I also add some granola for the crunch) it is sooo good! I also really like the 2%greek yogurt with honey! soooo tasty! A couple of years ago, I saw a recipe that I tried. I used a slow cooker, the usual proportions of liquid (either milk or water) to dry (in my case it was 3 to 1). Put this in the slow cooker, add a package of frozen fruit (your choice - berries or peaches are good) and let it cook overnight. It is ready for you in the morning and you can refrigerate the leftovers for coming meals. Agave syrup is a good alternative to sugar. I would need a lot of brown sugar! I just bought organic steel cut oats last week and made a HUGE batch Sunday to last me for breakfast all week long. I think as long as you do it all on 1 day, 30 minutes isn't gonna be horrible. Now every morning, I pop a premade one w/fresh fruit in the microwave for 2 minutes and add milk, brown sugar and flax seed and call it a day. I'm loving it! Instead of using brown sugar (which isn't all that bad ;)) try using agave nectar or honey too. I make my own egg white/turkey sausage breakfast sandwiches! I do a big batch at once, freeze them, then pop them in the microwave! I love oatmeal with all the toppings! I'd been wondering about the difference btw steel cut and rolled- good to know! Trader Joes has roasted coconut chips that are amazing added to oatmeal! Don't yell at me, but I am not a breakfast girl. Don't get me wrong, I LOVE breakfast food, but I almost never eat breakfast at the designated time (unless you count coffee). I do love steel cut oatmeal though - like others, I was turned off at first by the cook time since the heat and serve is so much easier, but making extra ahead of time is an awesome idea. When I do make oatmeal (usually for lunch), I like putting a teaspoon of flax seeds and mixing it in, as well as a little sugar in the raw on it - same principle as brown sugar, but I like to think it's a little healthier! :) Great and informative post! Oh I didn't know that there were difference levels of "good for you" when it comes to oatmeal. I will have to see if the store around the way has steel cut oatmeal then. I'm an oatmeal love too but lately I've been on this whole eating dinner leftovers for breakfast. I've been craving salt lately and dinners have just enough salt to hold me over. I do rolled oats every morning. During the winter, I've been slicing a banana into mine, and during the summer...fresh berries from the farmers market! YUM! Oatmeal is so good for you!